You can assign a system wide hot key and whenever you want Verbose to read the text on your screen just push that key and the software will read it aloud. Verbose text to voice software can also save your text documents or emails to mp3 or wav for you to store them on your Pocket PC or MP3 player, such as an iPod, so you can listen to them on your way home. 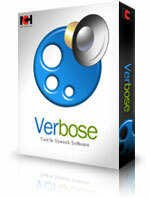 Verbose is a text to speech program which will read aloud any text or save it as mp3. Voice characteristics setting allows you to change speed, pitch and volume of the speech engine voice.